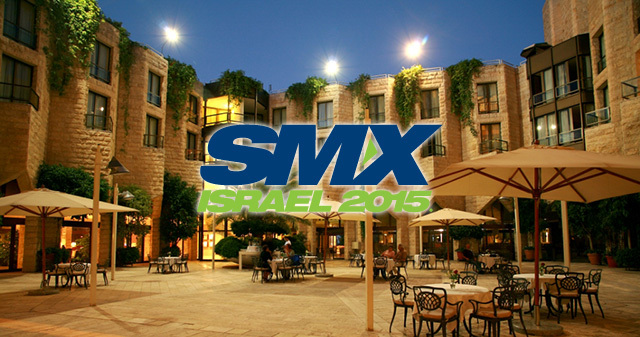 SMX Israel is now less than 3 weeks away. The agenda is 100% complete, you can review it below and it should be live at the official agenda page later today. We have a wonderful lineup of speakers both local in Israel and worldwide. The topics will range from organic search, paid search, display ads, analytics. the latest in app marketing and much more. There will be food, snacks, drinks throughout the day and an outstanding hot lunch served during the lunch break. The networking and learning opportunities is something you should not miss. We have speakers from Google, including Gary Illyes on Organic Search, Juan Felipe Rincón from the Manual Actions & Penalty team and Michael Fink from the Google Search Console team. So please check out the agenda and register soon. We may sell out and we do not allow walk-in registration the day of. So please register today at http://searchmarketingexpo.com/israel. I'd like to thank our sponsors including Analytics Ninja, ZEFO, Majestic, RankRanger, SimilarWeb, aimClear, Moz and the Inbal Hotel. The morning keynote will provide a never seen before Q&A session with a member of the Google Search Quality team who work on Manual Actions. If you ever received a message about a manual action on your site from Google in the Google Search Console, this is where they come from. This session will go through commonly asked questions around manual actions such as what one has to do to get one, the best ways to reverse them and how not to receive one in the first place. There will be time for live questions from the audience as well. The search ranking algorithm still highly weights links as a ranking factor. Managing both new links and existing links is a common chore for many SEOs. This panel will explore how link experts manage both acquiring great and natural links, while disavowing and managing the poor and unnatural links. Speakers: Dixon Jones of Majestic and Dan Petrovic of DEJAN Marketing. In 2014 Google released over 200 new features to Google AdWords, as you can imagine, it can be hard to stay on top of all the ways you can best leverage the search ad product. Google AdWords experts will share some of their favorite AdWords secrets with you, so that you can improve your ad quality score, cost-per-click rates, measurements and ultimately conversions. Speakers: Dan Perach of PPC Proz and Sophie Newton of Brainlabs. This session will be lead by Google’s very own Michael Fink. He will give you a deep dive on the Google Search Console, formerly known as Google Webmaster Tools. Google has, and continues to, make upgrades and improvements to the Google Search Console. This refresher will give you a walk through of some of the old and many of the new features in the Google search Console. Vast improvements in audience segmentation and message targeting has been enabled by new techniques and data accessibility through Google Analytics, Facebook, Twitter and other platforms. This ability to offer personalized ad experiences significantly impacts conversion rates and ROI. In this session, you’ll learn innovative tactics for segmenting audiences and tailoring ad campaigns that speak to prospective customers at a seemingly one-to-one level. Apps are the new frontier in the search marketing space, almost the “wild west” of SEO. The app world in terms of SEO is rapidly changing, the latest is App Indexing, Deep Linking and App SEO. This session will go through how to get your app content in the hands of mobile users through both core ASO (App Store Optimization) and leveraging the latest in app indexing and deep linking with Google, Apple and Bing. Ready? Google has said that its new mobile-friendly algorithm had a larger impact more sites than their Panda or Penguin algorithms. And though mobile SEO has much in common with traditional SEO, other factors weigh significantly in mobile search algorithms. For example, how important is the mobile user experience? Is your site responding properly to tablets vs. phones or even different types of phones? What about load time, link placement, http status codes, or the use of rich content? To be truly effective at mobile SEO, you need to pay close attention to these and other factors, and this session shows you how. In this session, PPC experts will give you advanced paid search tips to give you the edge over your competitors. The session will cover how to audit your paid search campaigns, perfecting landing pages, what PPC metrics you should a voice and some amazing paid search tactics and tools you may not be aware of. Bringing back our classic Hebrew speaking only session. Optimizing your SEO and SEM campaigns specifically for the Hebrew speaking searcher can differ from English language searchers. We have pros on this panel who can share their experience on a basic to more advanced level. This session will be given in Hebrew, not English like all the other panels. Speakers: Adva Rogalin of Universal Mccann Digital and Gil Slovik of The Grinder Ltd. The SEO Audit business is booming with all the algorithmic penalties and manual actions being handed out by Google these days. Before even taking on a client, you might decide to run an audit on the web site or you may want to know how well your web site is doing. These SEO experts will provide case studies in how they conduct SEO audits for both large and small sites with content and link issues. Ignoring mobile users is foolhardy in a world where mobile traffic accounts for as much as 50% of all internet traffic… and a large percentage of sales. But what’s the best way to attract and convert mobile users? Text ads? Display ads? Click-to-call offers? And what about targeting, by device, by location, or even by demographics of users on specific carriers? Search is changing quickly – today, Google and Apple are showing you search results before you even search. Google Now gives you traffic data before you head off to your next meeting. Apple gives you the weather and time to destination before you leave your home. Predictive search is just at its infancy and this session will explore what marketers need to understand to be ready for this shift in search. With Google Now On Tap and Apple Proactive Assistant, search is changing in a big way. They say, you aren’t a real SEO until you have had a site that was penalized. Truth is, you aren’t a real SEO until you have had a site that recovered from a penalty. This session will explore the various algorithmic and manual penalties and how to take steps to recover. Specific case studies showing you what works and what does not work with penalty recoveries will be delivered in this session. This panel will explore the paid and organic side of using social networks to improve awareness and branding. The panel will review Facebook ads and Twitter ads, plus go through the free alternatives to getting your message to your audience. Ten blue links on a search results page is becoming a rarity. Search engines want to provide answers based on structured data and entities. Google’s Knowledge Graph is Google’s early example of those answers. How can you survive and thrive within an answer search engine? We’re putting it all out on the table. Top SEOs, both local and international, will be giving up their best SEO ideas to the audience. Bring your notebook, you will want to make sure to write all these down. You can choke on all the data generated by site visits. Even the lowest-end analytics software and services offer hundreds of canned reports, but only a few of these are relevant for SEOs and SEMs. No matter what vendor you use, these reports should be customized to increase value to your business. This session looks at the reports most useful to search marketers and how they can be tuned to reveal the most useful information to help improve the ROI of your campaigns. Search and social media may seem like two different species, but they have plenty in common. Combine your search and social media marketing efforts and teams and maximize results of both. In this session, we’ll show you how search and social marketing teams can use their unique skills and knowledge to help each other in paid, earned and owned marketing. Gary Illyes is a Webmaster Trends Analyst at Google, working out of the Zurich office. He is the man behind the HTTPS algorithm, worked very closely on the mobile algorithm release and has stepped up at Google to help fill the void after Matt Cutts went on leave. Barry Schwartz will ask Gary Illyes questions that are on the minds of all SEMs. The session will end with open question and answer time from the audience.